Heat oven to 350°F. Make pie crusts as directed on box for Two-Crust Pie using 9-inch glass pie plate. In large bowl, mix cherries, lemon juice and almond extract. In small bowl, combine 3/4 cup sugar and the cornstarch; stir into cherries. Spoon into crust-lined pan; dot with butter. To make lattice top, cut second crust into 1/2-inch-wide strips with pastry cutter. Place half of the strips across filling in pie plate. Weave remaining strips with first strips to form lattice. Trim ends of strips even with edge of bottom crust. Fold trimmed edge of bottom crust over ends of strips, forming a high stand-up rim. Seal and flute. In small saucepan, place milk, 2 tablespoons sugar and the almonds. Heat to boiling; cook over medium heat, stirring constantly, 2 minutes. Brush over lattice strips. Bake 20 minutes; cover crust edge with strips of foil to prevent excessive browning. Bake 30 to 40 minutes longer or until golden brown. Cool at least 2 hours before serving. 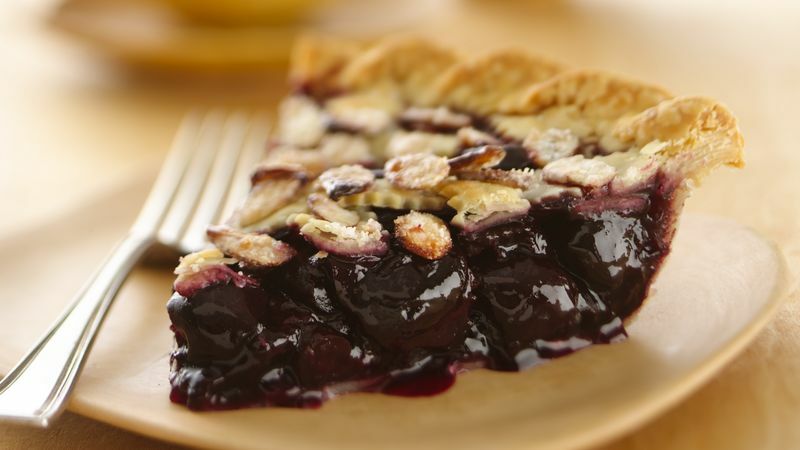 This recipe by Lola Nebel of Cambridge, Minnesota, won 1st Place at the Pillsbury Refrigerated Pie Crust Pie Baking Championship, 2009 Minnesota State Fair.